This year’s Great North Run offered the chance to watch two greats—Mary Keitany and Mo Farah—show surprising changes in their technique. I’ve written admiringly about Mary Keitany’s form since 2014 (when I started blogging), and admiring it since about 2011. But lately I’ve been feeling that something changed, and watching the Great North Run this year I became certain. Her head looks retracted, her upper body slightly arched. Her neck is long and her head moves steadily forward, so that the distance between her chin and throat never changes through her gait cycle. In other words, she pushes her head forward very efficiently… the perfect alignment of her head on the forward-tilting spine allows her to turn her upper body so that she peels her weight off her stance foot in a direction that maximizes forward motion and minimizes upward motion. 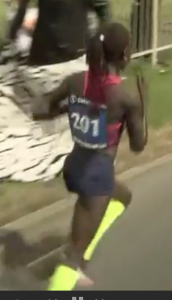 Looking at the video footage I had from that race it’s clear that her head and upper body are organized differently than now—not retracted, but instead reaching forwards. There’s no arch to her upper back. Going back to 2011 the difference is even more pronounced. Here you can see her neck and upper back and shoulders are very relaxed and mobile, and her forward lean from head to tailbone is perfect. This short clip shows it even better. By contrast, here she is in this year’s Great North Run. You can see she’s pulling her head back and arching her upper back. As far as I can see, this shift has happened gradually over the years. You argue it must be a positive one since her performance is better now than in 2011. However as always we must bear in mind that technique/form is only one component of performance. Her training and development over those years are an independent factor from her form. As she’s been moving her upper body backwards she’s been raising her hands. In 2011 you can see they only came to roughly heart height, whereas yesterday they came to the collarbones and above. Raising the center of gravity like this helps a runner, as I’ve written often before especially regarding Tirunesh Dibaba. However, optimally it’s done without pulling the upper body backwards. Otherwise you’re gaining the benefits of higher hands at the cost of losing the benefits of a relaxed upper body, good forward lean, and face forward. Vivian Cheruiyot has a better grip on this. Her hands come quite high but she doesn’t pull her head and shoulders back to lift them. Instead she keeps a perfect forward lean and face forward. I wrote about her form in depth during the Rio Olympics and it’s very much the same in this race. Perhaps what happened with Mary’s form is that she made a conscious decision to move her hands higher, but couldn’t feel how to adjust the movement of her shoulder blades to do it so she used upper back and neck extension to do it instead. She wouldn’t be alone in doing this, many of the Ethiopian women with high hands do the same. In that case, this is another illustration of the perils of making an intentional shift in running technique. There’s usually a good reason why you run the way you do, and by changing it intentionally you achieve your outcome by putting tension where it doesn’t belong, instead of releasing tension (which is usually what’s needed). 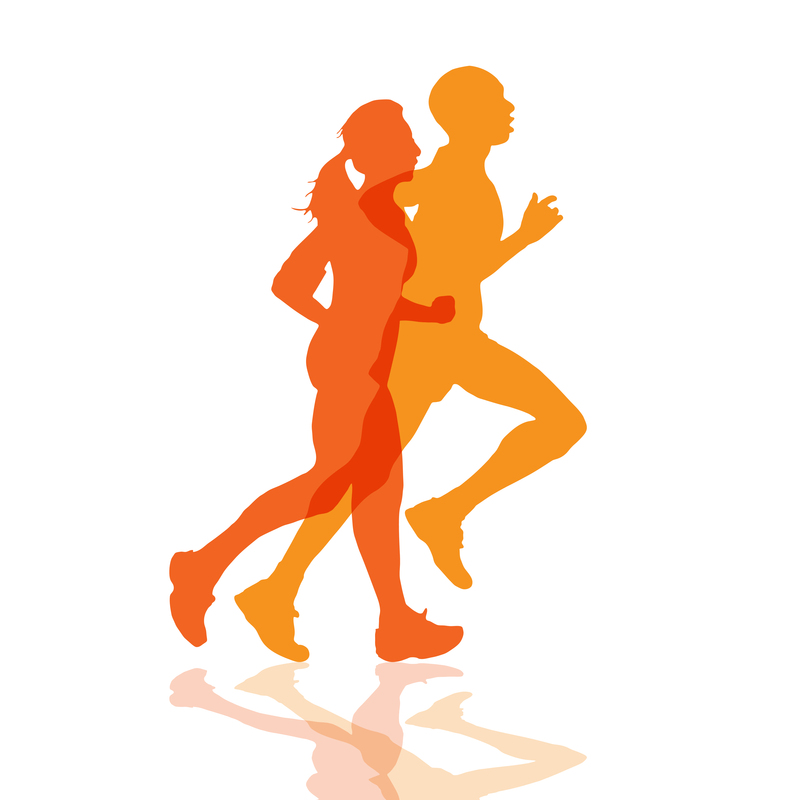 The higher you want your hands when you run, the wider you need to allow your upper back to become. However many of us chronically contract muscles in our upper back and shoulders and don’t even feel we’re doing it, so it’s then hard to know how to let it go to change our movement. That’s why running technique changes need to be made via an exploratory learning process that allows one to map out the elements involved, understand their relationships, develop a number of options, and then—by feel—choose the one that works the best. Robertson has better distance form than Farah. He has a good, clean lean that allows his head steady forward movement and ensures the force from the ground pushes it steadily forward. However Farah looks like he’s made some real progress on adapting his form to distance on the road as well, with a more contained upper body and arm movement, and less head bobbing (particularly the very expensive forwards-backward bobbing that’s his trademark). However, when it came time for Farah to kick, he clearly changed his movement. The phrase “changing gears” is really apt for a moment like this, as he opened up his stride and started vigorously pumping with his torso and head as well as arms. I’ve written a lot about this gait over the years. Robertson changed nothing about how he was running, other than to briefly drop his head as if in dejection. I would argue that more than anything else, this is a technical problem Robertson has. Running faster means running differently, sooner or later. And running faster when you feel like you’re already at your max means you have to change what you’re doing. Because just continuing to run the same, but harder, isn’t an option. More freedom and mobility in his upper body—spine, shoulder girdle, arms—would allow Robertson also to change gears like Mo does, applying more force to the ground from his upper body instead of asking his fatigued legs for more. It would be cool if he’d learn how to do that. As much fun as it is to watch Mo shift gears at the end of a race, it would be even more fun if more runners could go with him, right up to the finish line. I will try and be there Riday. Question – what do you make of Mary K’s head tilt to the right? Super, John, looking forward to seeing you on Facebook then. Mary has been tipping her head right especially when tired/running hard as far back as I’ve seen video. Usually that would tend to put a runner’s weight on their left foot more than right (which is the norm anyway), but I don’t really see any significant ramifications. It’s always sort of surprised me. Both those things are true, Bob, but that just happens to be when I got the good screenshots. I’ve actually been noticing this in her running for at least the past year, and not just when she runs downhill. After this race I finally sat down to look through old videos to see if it really was new. Even if Mo looks better than on track, I thought he’s still running like in his 2014 london marathon debut. He uses a lot of power for each step along with a slow cadence, which I don’t think will help him in his marathon career. When you have time, can you talk about joyciline jepkosgei who just broke the 10k and half marathon records? That marathon debut really put the shortcomings of his form in stark relief. I felt he’d improved a bit when I watched this race, but he does have a way to go yet. As for your question about Ayana, that’s perfectly in synch with the hip flexors blog post I’ll also be talking about. Thanks, and stay tuned! Previous Post Why Tight Hip Flexors Are Bad For Runners Next Post Activating Your Glutes Fixes Tight Hip Flexors… or does it?